The new Catalan party, Catalunya en Comú, faces challenges all new political organizations must overcome. But I’m not going to win because the only way I’d see I came in first would be if winning meant that I was going to escape the coppers after doing the biggest bank job of my life, but winning means the exact opposite. On April 8, Catalunya en Comú, a new Catalan party, officially launched under the sponsorship of Barcelona mayor Ada Colau. The new project aims to turn the successful electoral alliance between Barcelona en Comú (Colau’s own party), Podem (the Catalan branch of Podemos), Initiative for Catalonia Greens (ICV, a Green party with Eurocommunist origins), and United and Alternative Left (EUiA, the Catalan branch of Izquierda Unida, the Communist Party of Spain’s electoral front) into a single party. Already, the alliance won the Spanish general elections in Catalonia on December 20, 2015 and on June 26, 2016, producing high expectations for this new formation. Unfortunately, Barcelona en Comú, ICV, and EUiA split with Podem over the group’s organizational model. As a result, Podem decided at the last minute not to join, and the party’s debut felt half-hearted. But the factions will likely overcome these problems before the Catalan parliamentary elections at the end of this year. At the very least, Podem and Catalunya en Comú will form a joint list. Only then can we consider the process of creating the party concluded and clearly evaluate the results. For now, however, we can assess Catalunya en Comú’s founding congress, especially its procedural and strategic choices; we can also analyze Barcelona en Comú’s history, since Colau’s local formation is the dominant force in the new party. Despite the alliance’s previous successes, very few substantial discussions of the new party have emerged. Almost no one has analyzed the new formation’s underlying politics, perhaps as a consequence of its poor theorization. The attacks coming from the independence movement represent the only exception; it sees Colau’s new party as competition and wants it to clarify its position on Catalan independence before the referendum planned for next September. When we dissect the Commons — as Colau’s group is informally known because of its attachment to the idea of the commons — we must do so without falling into sectarianism (which a part of independence movement relies on) or flattery (which many who are drawn into an expanding political space borrow). Neither helps us advance the strategic debate in general nor rupturist positions in particular. The new political project arrives at a moment when the expectation of political change — which began with the 15-M movement, the independence movement, and Podemos — still exists, albeit in weakened form. Above all, Catalunya en Comú appears in a moment of political fatigue following the long Spanish electoral sequence, which began with the European elections of May 2014 and culminated in the general elections of June 2016. This feeling is intensified in Catalonia, whose own political sequence is bookended by the regional elections of November 2012 and September 2015. The proliferation of campaigns and the acquisition of institutional responsibilities after left-wing victories in cities like Barcelona have eroded and absorbed militant energies. The ongoing political crisis and the integration of new political actors have also diminished the movement’s early enthusiasm. As large-scale social struggles have largely died down, a certain sense of routine has returned to daily life. The new political party represents the culmination of the Catalan left’s reorganization — whether it uses the term “left” to define itself or not — which the political earthquakes of 2011 and 2012 generated. But the Commons is trying to do this in a climate of exhaustion, making it harder to mobilize new activists. Despite this, we cannot deny the important electoral space that the new party may hold. Since 2012, Catalonia has witnessed an eruption of new political projects and militant politicization. First, in the November 2012 parliamentary elections, the pro-independence and anticapitalist Candidatures d’Unitat Popular (CUP) won 3 percent of vote and claimed three seats, around which activist and anticapitalist groups — unrelated to the independence movement — organized some support committees. Although CUP did not implement any specific strategy to surpass its boundaries, it did experience a significant linear progression. Then, in April 2013, Benedictine nun Teresa Forcades and economist Arcadi Oliveres launched the sociopolitical movement Procés Constituent, which aimed to unite a new majority and open Catalan politics to greater democracy through a constituent process. It created an important dynamic of self-organization, staging massive rallies and assemblies throughout Catalonia. The group’s desire to win the elections, rather than merely open a small crack in the political system’s left flank, drew many supporters and was a strategic novelty. The next January, Podemos appeared. Despite its relative weakness in Catalonia, it triggered another round of politicization and self-organization with another round of new local branches. In the summer of the same year, Ada Colau launched Guanyem (later renamed Barcelona en Comú) with the goal of presenting a candidature for Barcelona’s municipal elections in May 2015. Synthesizing and improving on the scheme Procés Constituent and Podemos used for their launches, Guanyem prompted a new wave of organization from below. From Above or From Below? Things look very different today. In a certain sense, the Commons represents the most important political process of any to date, but the dynamics that accompany it now lack momentum. This situation reflects both the overall political context and Barcelona en Comú’s conservative strategy. Colau’s party seemed at times to be afraid of being overtaken by its alliance mates, nor did it know how balance inter-party negotiations with opening a dynamic from below. Colau’s group has played a leading role in building a new party. However, given the different political context, they adopted a more conservative approach in Catalonia than in Barcelona. While they were complete outsiders before, Colau’s group is managing an important merger of four parties and the party has experienced significant strategic mutations since 2015. Building the party from the four organizations featured mostly in-group debates with little strategic content, a situation aggravated by Podem’s ultimate withdrawal. As a result, Catalunya en Comú includes members of the founding parties but has not generated a new wave of politicization or attracted unorganized people. The attendance numbers from the founding assembly eloquently express this: 5,540 people voted (online or in person) out of the total 6,805 registered and validated members. About 1,500 people attended the congress. These figures aren’t bad, but they do not demonstrate strong support from below. The new party has as much electoral space as it does militant fragility. In this way, Catalunya en Comú shares a structural weakness with all the new political tools that emerged after 15-M. Indeed, the split between electoral power and militancy has plagued left-wing movements for a long time. One of the great paradoxes of the CNT was that, despite its huge membership in the city, the number of union activists was relatively small. The majority of cenitistas participated little in the internal life of the unions, attending union meetings rarely, if at all, and paying union contributions only sporadically. This gap appears throughout the history of workers’ and popular organizations, although its precise magnitude varies. The disproportion between organized power and mobilization capacity manifests itself in the post–15-M political formations in two ways: as a contrast between organized militants and the electoral force, and between that electoral force and the party’s capacity for social mobilization. As a result, the new parties tend to have enormous electoral weight but poorly organized militants and a low capacity for mobilization. Many factors have contributed to this situation, including the weakened labor market, the complication and pluralization of life paths, the transformation of cultural and collective identities, the individualization of social relations, and the role of mass media and social networks. We are in an era, no doubt, of liquid militancy, to borrow Zygmunt Bauman’s well-known metaphor. Faced with this situation, a party can adopt two attitudes. One, it can refuse to recognize the problem and even build its strategy on denying the very concept of militancy: the Podemos leadership has followed this path with its bureaucratic utopia of a party without militants. On the other hand, a party could develop mechanisms that foster political participation and stimulate organizations from below, rethinking models of militancy and creatively combining new technologies with conventional methods: the Anticapitalistas inside Podemos have tried to do just that. Liquid Bolshevism? Perhaps not, but at least an attempt to face the challenges of engagement and commitment in the present. Catalunya en Comú does not seem concerned about organizing from below, although this comes more from their practice than from any conscious decision. Formally, the new party wants to organize as many people as possible. Some of its leadership likes to quote the London Corresponding Society’s motto: “That the number of our Members be unlimited.” As E. P. Thompson explained, this slogan signifies the end of any notion of exclusivity in politics. At least in principle, Colau’s core team would like to go beyond electoralism and build a strong organization. Unfortunately, the party’s conception and prevailing political activities do not give any systematic attention to organizing from below. The founding congress left many uncertainties. Attendees did not address many of the strategic and programmatic debates. It appeared as a potential electoral colossus with a rather conventional organizational structure, a weak militant base, and a limited platform that evades the Gordian knots that any program of social transformation must face. The specter of the Commons turning into “Eurocommons” appears on the horizon. At a certain point in their historical lives, social groups become detached from their traditional parties. In other words, the traditional parties in that particular organizational form, with the particular men who constitute, represent, and lead them, are no longer recognized by their class (or fraction of a class) as its expression. After 15-M, any political and strategic understanding of the crisis necessitated grasping electoral opportunities and devoting the maximum possible effort to this terrain in order to definitively destabilize the traditional party system. That said, real or potential success in elections often coexists with (relative) failures in all other spheres, generating an electoral hypertrophy of political strategy. A thin red line separates electoral audacity from electoralism, and it is very easy to cross it without even realizing or wanting to. Avoiding this shift requires conscious effort and the dedication of human and organizational resources to the non-electoral and non-institutional fronts, which prevents these activities from fully absorbing a party’s militants, cadres, and internal discussions. Several of the new party’s leaders have insisted that they will not limit themselves to elections and have framed the Commons’ project as a broader struggle for hegemony, which necessarily goes beyond electoralism and party politics. But such statements still only count as general proclamations rather than strategic proposals. While the party has made its electoral strategy clear, it hasn’t released its plans to take root in society and help to build alternative social powers. Neither the party’s theory nor practice has settled the dialectic between self-organization, mobilization, and electoral-institutional work. Unlike Podemos, where leaders developed crude theories about building an electoral war machine, Catalunya en Comú has engaged in little theoretical reflection about the kind of organization it wants to become. Surprisingly, Colau’s party has put little emphasis on the need to create a new kind of party. In fact, the core group has undergone a very rapid conceptual and organizational standardization. Barcelona en Comú, created for the 2015 municipal elections, offers an excellent case study of the new party’s strategic and organizational ideas. Of course, the new Catalan party does not represent an expansion of the already existing formation. The balance of power between Colau’s group and the other, more traditional forces of the Left — in particular ICV — is spread more evenly throughout Catalonia than it is in Barcelona. 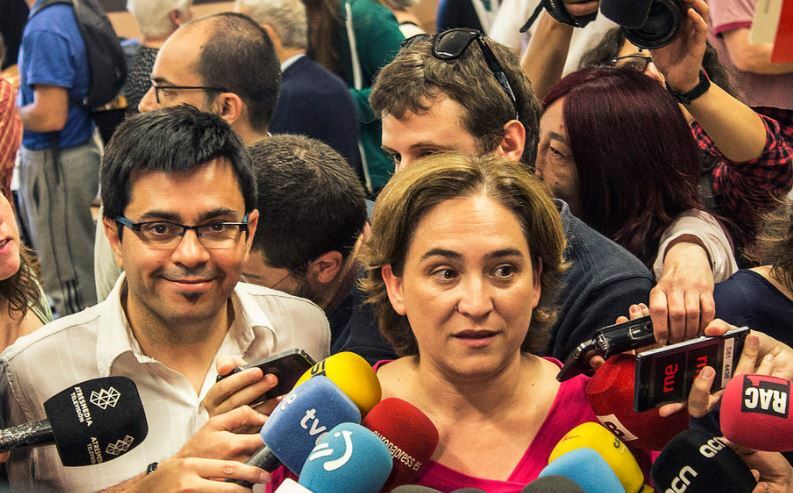 As a result, the Commons will likely become a political-organizational synthesis between Colau’s group and the ICV, meaning that it will experience a mix of the problems that both new and traditional parties face. Since its founding, Barcelona en Comú has been working as a non-theorized and unacknowledged electoral war machine and as a complementary organizational device to Colau’s city government, which, despite its limitations, has gone much further than any conventional left-wing administration. The party was formally structured following Ada Colau’s victory in May 2015, but its role was never clearly defined. Before the election, it had a clear objective: channel all its militant energy and political capacity into the campaign. Afterward, however, Barcelona en Comú made no serious attempt to maintain any real drive from below or to stimulate militancy. In contrast to Podemos, the leadership did not trample the rank-and-file members. Instead, the party became a frozen electoral war machine, waiting to be activated on subsequent occasions. It functioned as a complement to the city government, where many of its active members took positions. Despite this institutionalization, a remarkable number of neighborhood activists have held on. Unfortunately, their militancy has not played a clear role in the party’s dynamic. The party’s tasks both in power and in society more broadly have remained unclear. It has adopted a subordinate position toward the government, directed by the prevailing logic of autonomy from the party. While a certain level of independence is necessary — we cannot imagine that every municipal action can or should be discussed and supervised by the party — Barcelona en Comú made subordination the normal relationship between party and government. Meanwhile, it failed to establish social functions and developed a weak relationship to the city, with no clear plans to intervene in communities and social movements. The party’s structure and apparatus became fragile because the bulk of the cadres worked for the city. It has not acted as a counterweight to the government but as its subordinate complement. Nor has it acted as an instrument of non-institutional political intervention in order to foster social and community organization. As a result, Barcelona en Comú has related to the city through its executive function rather than through the party itself. Neither monitoring the government nor engaging with neighborhoods, the party had no clear raison d’être and lost momentum. Although it adopted a fairly reasonable formal structure, Barcelona en Comú has many organizational shortcomings. The governing bodies have experienced serious dysfunction, often turning into spaces with little deliberation or where issues are not seriously discussed at all. Further, the relationship between members and the party’s higher bodies tends toward a top-down unidirectional structure in which militancy receives little real space for policy discussions. Interesting, Barcelona en Comú inherited these deficits from two opposing logics: first, from traditional parties’ hierarchical structures and, second, from social movements’ horizontal informality. The interaction between a party’s formal and informal structures determines its actual organization. Barcelona en Comú didn’t simply attach its informal logic to a formal one, as in many other parties. Instead, thanks to core activists’ political culture and experience in social movements, informal structures have taken on a life of their own. Leaders encourage informal undermining of formal structures — a kind of formalization of informality — which works against the institutional hierarchy derived from local government. This organizational form results in a paradoxical combination of the well-known tyranny of structurelessness (as described by feminist writer Jo Freeman) and of the hierarchic decision-making system of delegation in which the government prevails over the party. The government’s vertical organization, the formal bodies’ relative weakness, and the strength of informal relations define Barcelona en Comú’s political-organizational culture. Most of the problems the party faces would be shared with any organization that had achieved such overwhelming electoral and political successes in such a short time. Relations between government and party are always complex, not to mention the challenge of establishing the role of a party that is in government. The same goes for internal democracy and membership participation in decision-making. We should therefore not attribute these issues exclusively to the leadership’s choices — to do so would be rather demagogic and superficial. What is disturbing is not that these setbacks exist, but rather that the leaders do not perceive them as problems. Non-problematization of serious deficiencies has become the real problem. This is what we may call the problem of non-problematization. Merging organizations always produces complications. Addressing all interests is not easy, and doing so can often damage democratic procedures. We should not be surprised by the new party’s obstacles and mistakes: it would be absurd to expect a clean process in which everything comes together perfectly with little friction. Beyond these inevitable difficulties, however, the substantive decisions regarding the new party’s organizational model do reveal internal democratic fragility. Taken with the lack of pressure from below, these decisions indicate that Catalunya en Comú will orient itself toward parliament and the party machine. We can already detect four main shortcomings of the adopted organizational model. First, the leadership structure has serious flaws. While a thirty-two-member executive commission is charged with making decisions, the 120-member national coordination committee has poorly defined functions and may end up playing a merely advisory role. Second, the party used an open-list, majority system to elect both bodies, but it restricted the number of candidates per list to ensure that at least some seats would go to minority groupings. By electing those candidates with the most votes, the party could not ensure that each list wins a number of seats equivalent to its members’ votes. In addition, the majority bloc could easily maneuver the lists: sponsoring friendly minority groups would block critical minorities and smash opponents. Another problematic aspect, although less serious, comes from the decision to allow the whole membership to directly elect the executive committee. This isn’t an undemocratic procedure, but it does reinforce the smaller committee’s symbolic power. Better to elect the larger leadership body — in this case the national coordination committee — by direct vote and then elect the executive from within that body. That system would allow the broader committee to benefit most from the legitimacy of direct election. Finally, the decision to name Colau’s list En Comú Podem, the name used by the alliance in the Spanish elections of December 20, 2015 and June 26, 2016 that was the forerunner of the new party, poses a problem [En Comu Podem was the name of the alliance in the elections of December and June that is the forerunner of the new party]. Colau and her inner circle instrumentalized a name that belongs to everybody, including internal minorities, not only to the members of the main list vying for leadership roles. This choice reflected a more fundamental problem in the party’s launch: the lack of clear criteria when organizing the founding congress. The party only set the main rules at the very last minute, creating a somewhat improvised feel. Despite these problems, the new Catalan party is not falling into the same traps Podemos has. Four positive aspects demonstrate improvements on Pablo Iglesias’s project. First, Catalunya en Comú does not have a bureaucratic-populist state of exception that seeks to uncover and squash anticapitalist dissent. Second, despite the party’s democratic limits — which its leaders themselves voluntarily promoted — several of its leaders share a democratic trajectory and mood; third, the party has so far avoided Podemos’s model of warlike rhetoric, preferring a healthier political culture that seems to combine the movement approach with a bureaucratic-institutional structure. Finally, Colau’s new party has taken up Podemos’s politics of spectacle in a more nuanced way. Catalunya en Comú’s founding congress featured actual decision-making, rather than a show of adrenaline (like those of Vistalegre). That said, it did lean toward spectacle at the expense of profound debate. That Catalunya en Comú has not reproduced all the excesses of Íñigo Errejón’s bureaucratic-electoral war machine is, however, little consolation. We shouldn’t evaluate the new party on the basis of Vistalegre’s bureaucratic-populist dystopia but on the potential and expectations of the 15-M movement. From that point of view, we cannot assess Colau’s new project positively. Six years after the memorable days of May and June 2011 — and three years after the onset of the Spanish political system’s crisis, marked by Podemos’s emergence — we cannot help but come to a bitter conclusion: the new political projects that have appeared, often grouped under the confusing label “new politics,” are not only undemocratic but in some respects worse than the old politics. This is a blow to 15-M’s legacy, which is falling into the abyss of the new politics’ organizational and strategic gaps. While Podemos’s structure and political culture are already fully crystallized, the situation in Catalunya en Comú still remains provisional. A new congress on organizational issues should be held before the end of the year, where members can debate not only the approaches to party structure but discuss something much deeper: the soul of the party and its core leadership. Although some of the key figures in the Commons share a radical political trajectory, they are a clear minority in the leadership bodies. If we were to ask how many members of the executive committee would feel comfortable at an event like 15-M, in a movement like the Platform for People Affected by Mortgages (PAH), or among the so-called “tides against cuts,” we would find the answer discouraging. (Obviously, being a true activist does not guarantee anything; many of those who today more or less embrace realpolitik were activists in the past.) If we asked how many leaders feel politically or intellectually concerned about the Russian Revolution’s centenary or the 150th anniversary of Das Kapital, the answer would be equally demoralizing. (Again, empathizing with October 1917 in itself means nothing and in fact fits perfectly into a bureaucratic culture that promotes fossilized strategies linked to twentieth-century imaginaries.) If we dared to ask how many leaders would join 15-M and care about 1917, the answer would be devastating. We can analyze this situation in terms of strategic dissonance, borrowing Leon Festinger’s theory of cognitive dissonance, which postulates that when individuals have contradictory thoughts, they set up mechanisms to recover a perception of internal coherence in order to avoid psychological distress. Critics of this approach have emphasized its overly psychological character, arguing that it renders complex social processes as individual contradictions. Taking that into account, we can understand strategic dissonance as the result of the leadership’s strategic options and the context in which it operates. In the case of Catalunya en Comú, that includes a strong electoral and institutional space, a large segment of reformist currents inside the party, low militant capacity from below, and a momentary retreat of social struggles. In this scenario, the party risks making a virtue out of necessity and solving the dissonance by reducing its initial ambitions. This would imply a shift from voluntary, self-contained radicalism to an internalized and rationalized moderation. The few leaders and party cadres who maintain radical positions will experience increasing loneliness as the marathon drags on. Radical impulses might be exhausted before the party reaches the finish line, consumed by the long march through institutions and electoral campaigns that leave no oxygen for emancipatory impulses. Alan Sillitoe tells us about this kind of solitude in his 1959 novel, The Loneliness of the Long Distance Runner. The story focuses on Colin Smith, a juvenile delinquent from a working-class background. Thanks to his athletic abilities, he finds himself choosing between life as a successful athlete and maintaining his outsider status. On the day of the big race — the Borstal Blue Ribbon Prize Cup For Long Distance Cross Country Running (All England) — Colin allows himself to be beaten in the last few meters. He does this to exact revenge on the reformatory’s director, who wanted someone from his center to win the prize. Colin’s decision is his way of rejecting the hypocrisy of a society that rejects him. Looking at the possibility of a better life, he decides to remain in the loneliness of the long-distance runner: “They aren’t going to get me on this racing lark,” he says to himself. “They aren’t going to get me on this racing lark, this running and trying to win, this jog-trotting for a bit of blue ribbon, because it’s not the way to go on at all, though they swear blind that it is.” To adapt or to be faithful to yourself; to accommodate or to remain not like them. Colin opts for the latter. The situation’s intrinsic complexity, both on the personal and on the political level, comes from the fact that being true to oneself should not require staying in (social and political) marginality, but rather leaving it without losing self-identity. Colin does not have this option. This third choice implies understanding victory and defeat differently than both the director of the reformatory — who sees success as joining the elite — and Colin — who sees remaining in the margins as the only way to be true to himself. By voluntarily losing the race, Colin wins because he humiliates the director and shows his rebelliousness. In the end, however, he also loses: his personal revolt against social conventions pushes him into a struggle that he has already lost. He must permanently flee a hostile society in which he is nothing more than cannon fodder. The possibility of losing by winning is the main strategic lesson that parties such as Catalunya en Comú or Podemos should consider, so that they do not fall into it. In this case, they risk losing not thanks to their stubborn fidelity to themselves, but because they would adapt in order to be more like the powers that be. Unlike Colin, they would lose by winning: winning elections at the cost of political denaturalization, winning after no longer being themselves, winning to stop being themselves. From Colin Smith’s story, we know that winning comes from accepting the genuine loneliness of the long-distance runner. Leading an institutionalist and moderate political apparatus will never count as victory. On the contrary, the anticapitalist struggle — in which the rewards often hide beneath the sacrifices and where it is sometimes necessary to run against the stream, always without resignation — strives for this kind of success. To win without changing oneself and to change the world — this is our particular dialectic of the loneliness of the long-distance runner. Josep Maria Antentas is a professor of sociology at the Autonomous University of Barcelona.